THIS WEEKEND, COME CELEBRATE YOHO ARTIST STUDIOS DAY as proclaimed by the Mayor of Yonkers in an inspiration ribbon cutting that unveiled the new facade/entranceway. The YOHO Artist Studios will step forward into its new role as a center for the arts for southern Westchester with an Open Studio Weekend on Apr 18 - 19. Check out the artistic and avant-gardt cube & glass themed entranceways and soaring blue banners that now grace Nepperhan Avenue. The building's new dramatic pose will herald this debut and stimulate excitement that will be the talk in the art community. April 18 - 19, 2009: SIXTH ANNUAL YOHO ARTIST OPEN STUDIO: Yonkers' artists at YOHO are having their 6th Annual Open Studio and the event is open to public. All are welcome. Location: 578 Nepperhan Avenue, 5th Floor (at corner of Lake Ave) at the former Alexander Smith Carpet Mills Buildings (enter from rear parking lot - entrance on Lake Ave or park in the City parking lot across the street and enter through our new main entrance! 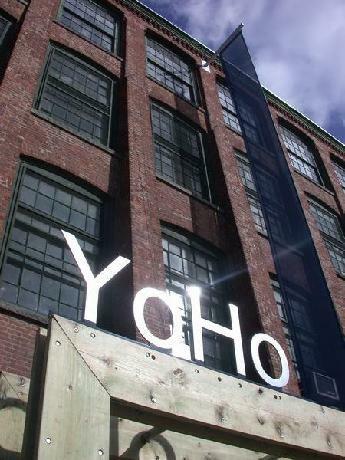 BRAND NEW YOHO ARTIST STUDIOS - Affordable and Inexpensively Priced private Studio Space Available Soon! Currently constructing new studio and gallery space on the 4th floor at 578 Nepperhan Avenue . Come see what we have to offer. Spaces starting as low as $400/month. Special Promotion if you sign up before the spaces are ready - 25% off for the 1st 3 months! SHARED COMMUNAL ARTIST WORK SPACE AVAILABLE - Designed for the starting artist. Communal space can be creatively inspiring in room of artists. Incredibly plrice at only $250/month plus optional storage locker. Also available - small office, warehouse and manufacturing. Call (917) 682 - 5172 or (212) 317 - 1423 ext 601 to make an appointment to see them.